Spot silver prices ended the week in a strongly bullish mood with a wide spread up candle which broke above the $19 per ounce level further confirming the long term bull trend for silver which, to a large extent, is mirroring gold’s strong performance. This bullish sentiment is further confirmed by the 9 day moving average which has crossed above both the 14 and 40 day moving averages, and the longer term trend is also clearly evident from the support provided by the 200 day moving average. 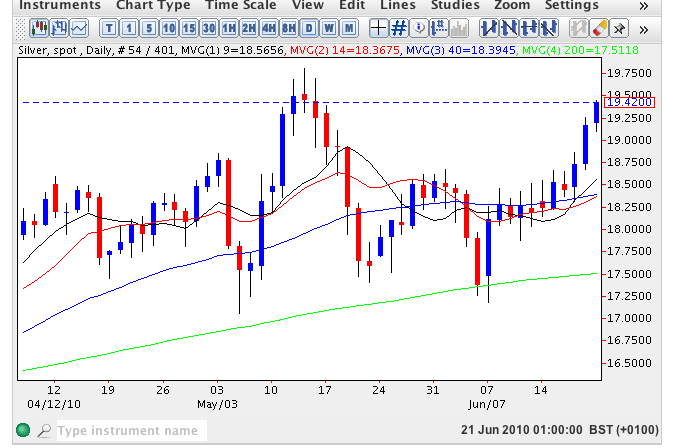 As a result we can expect to see silver prices continue to move higher this week and any break above $19.80 on the daily chart should see us achieve the psychological $20 per ounce in the short term. From there we can expect to see a run towards $21 per ounce and beyond in the medium term.